Ronald J. Stouffer is a former senior research climatologist at the Geophysical Fluid Dynamics Laboratory (GFDL), Princeton, NJ, a federal research laboratory within the Office of Oceanic and Atmospheric Research, National Oceanic and Atmospheric Administration, of the U.S. Department of Commerce. Stouffer is one of the leading climate modelers in the world, and uses complex numerical models to study and predict the behavior of the earth's climate system. Because of his scientific contributions to climate research, he is a central contributor to the Working Group 1 assessment reports from the Intergovernmental Panel for Climate Change (IPCC) and was a chapter author for the 1995, 2001 and 2007 reports. Stouffer first came to GFDL in 1977 from the Pennsylvania State University where he received both Bachelor's and Master's degrees in Meteorology. During his 38 year tenure at GFDL ending in 2015, he has worked closely with Syukuro Manabe, who was the first scientist to develop a numerical model that joined the atmosphere and ocean into a single coupled model to represent the earth's climate system. Stouffer has published a number of ground-breaking papers and has authored over 120 papers on global climate change. 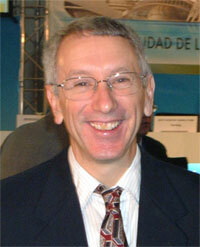 In addition to his responsibilities as IPCC chapter author, Stouffer is a member and chair of the World Climate Research Program (WCRP) Coupled Model Intercomparison Panel (CMIP), an editor of the journal, Climate Dynamics, and has received a number of awards, including the WMO Norbert Gerbier-Mumm International Award (1999), the NOAA Administrator's Award (1996, 2008), NOAA's Career Achievement Award (2017), the Department of Commerce Gold (2002), Silver (2005) and Bronze (2007) medals and five NOAA Distinguished Authorship Awards. He is a fellow of the American Geophysical Union and the American Meteorological Society and also a Pennsylvania State University Alumni Fellow. Stouffer is currently a adjunct professor at the University of Arizona and also employed by ClimBiz (a small private climate consulting company).